early for migration in Western North Carolina. However, Rachel said her guests were insistent about a half-day birding package. I was still a little bit skeptical when I arrived at the B&B around 8:30 a.m. last Saturday; concerned that the guests didn’t understand that our species pool would be limited to winter residents, plus perhaps a few waterfowl at Lake Junaluska and at best one or two early migrants. But when I sat down to have a cup of coffee with Dr. Ashwini Anand, his wife Prabhune and son Pavan, my fears were quickly dispelled. The good doctor explained that he and his family loved to travel and that they were amateur photographers. He said that on a recent trip to Belize they had encountered a group on a birding tour and this group’s focus and excitement on observing birds was infectious. He said that he and his family were casual observers of feeders on their property in London, Kentucky but after encountering the group in Belize they had become quite interested in learning more and more about birding. Their enthusiasm was contagious. It pricked at a kind of common bond I think most birders share at some level and recognize in others; they had been bitten by the bug. Well we started out at Lake Junaluska in hopes that Friday’s storms had knocked some migrant waterfowl from the sky to go with the migrant swallows I knew had returned. We weren’t disappointed. We found northern shovelers, blue-winged teal, ruddy ducks, a lone female ring-necked duck, a couple of female buffleheads, double-crested cormorants, pied-billed grebes and a nicely colored common loon. 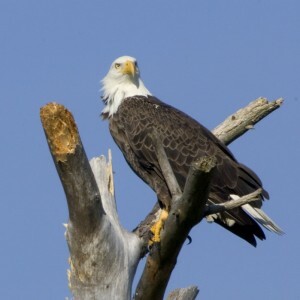 And the birding gods were kind to us as near the new wetlands we found a mature bald eagle perched in a tree at the lake’s edge. We got great looks at tree swallows, northern rough-winged swallows and purple martins at the lake but no barn swallows. That was quickly remedied when we made a short stop at Richland Creek just across the highway from the lake. Barn swallows were cruising the golf course. And as we were watching the barn swallows, Pavan noticed some movement in the brush at the edge of the creek. We watched as a song sparrow chased a Louisiana waterthrush out of the brambles and sent it farther down the creek. As I mentioned, the Anands were avid photographers and long clear looks at the bird Thoreau said, “…carries the sky on his back.” – eastern bluebird, plus cooperative American goldfinches and a red-winged blackbird showing off its epaulets led to a cacophony of shutter clicks that would make the paparazzi swoon. With time running out we headed up the Blue Ridge Parkway to try for some high-elevation specialties. We were able to call up one small group of cooperative black-capped chickadees near Waterrock Knob before we had to head back to Andon-Reid. Back at the B&B we tallied our species list, I believe we wound up with 44 species. I think the Anands were pleased, I know I was. It is always a pleasure to be reconnected to that instinctive inspirational spark; that pure and simple joy that nature brings to the human psyche.